Incorporating A-Z into my regular Final Friday Fiction. To see the preceding tales, click here. 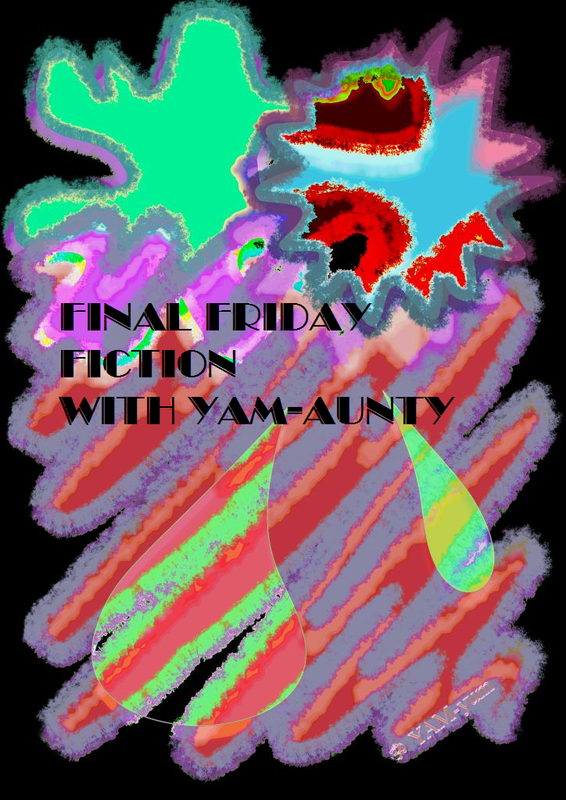 Those dropping by from A-Z, the theme remains but couched now in some short fiction. If you wish, you may join in but please read the rules… unless you have a story/poem/anecdote posted according to them, please do not use the linky. The YAMster can be surprisingly strict! Low Sooz was brazen. Hill Bert had no idea she had it in her. There was a bit of him which started to wonder. Did she have her own agenda in rising through the ranks? Each night, though, she returned to him on their favourite patch of froth moss and he was reassured. She was his great love, and he could imagine no other. Every time, Low Sooz requested his forgiveness. There came the day he wondered at this. Low Sooz gleamed, her smile so gentle and the look in her eye so understanding, Hill Bert thought that if he never woke tomorrow, heaven could not be this fine. "Yes, Hillbee… but then to forgive would be greater still." This post is connected with reference made in the "Q" for Kharu post. Forgiveness was alluded to and it brought out some great comments. One, in particular, prompted me to extend this post with the core of my response to it. It can be very difficult to rise above our ego-self both to ask and to give 'sorry', no denying. Please think on this, however... Forgiveness, if applied, does heal. However, in continuing to 'work' the wound, if pain continues or worsens because of this, then forgiveness has not been applied, only words said. Just as there is capital 'ell' Love, there is also True Forgiveness. No grudge held, no festering, no revenge plotted. If we learn to say 'it's okay I forgive you' without it being in our hearts and minds we are not only misleading the forgiven but damaging ourselves as the forgiver. Conversely, if we learn to say sorry for the small things each day, with genuine intent, knowing how to seek forgiveness, we can also find it in ourselves to forgive on a daily basis. Our 'forgiveness muscle' gets good exercise so that when the real test comes, we can find that space in our hearts to ask and to give forgiveness. To do this when the need is greatest requires the strongest part of our character, that part which is the master of its own destiny. Forgetting is not a required part of forgiveness. However, if forgiveness has truly taken place, the remembering can be viewed as if on a screen; the incident may be unpleasant but can not directly affect us. True Forgiveness releases bonds of the past no matter how strong or how tenuous. Only then, can we start afresh. Beyond the purpose of these articles on spiritual uplift, as a counsellor, I had to work with many clients on aspects of asking and giving forgiveness and there are a variety of exercises and tools which can be applied, even for the deepest and most ancient pains. This is clearly not the place to elaborate on such - but I can provide this link, from which arise a number of other highly valuable links, for general reading and understanding. Learning to properly seek and give forgiveness is one of the most empowering things you will ever do for yourself. YAM that too some serious work to include into your A-Z....bravo. We'll link up before bedtime tonight. 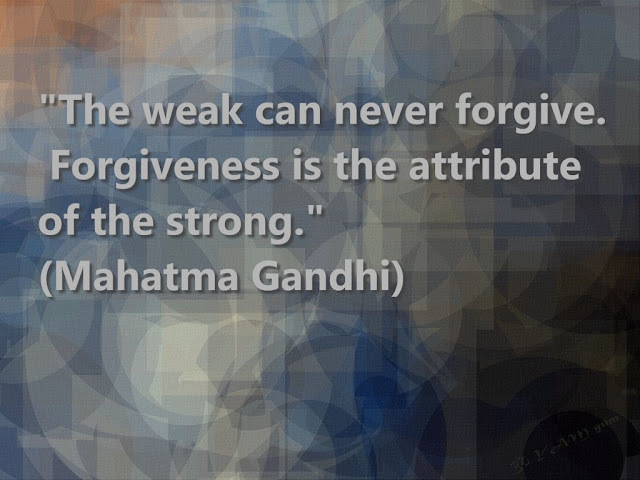 "Forgiveness is the attribute of the strong." Question: In true forgiveness, is it possible to still hurt for the other person and their condition that caused them to deeply hurt you? this is an excellent question! Beyond theory, it is also my experience that to in true forgiveness no hurt remains... but there CAN be sorrow. There is no doubt that in such deep hurts the relationship from that point, even with forgiveness, will not hold the same quality it did before and we can definitely be sad that someone got it so wrong - but if we have indeed truly forgiven, there will be no trace of hurt. Its not easy to forgive and let go as one feels hurt and sorrow. I find it quite difficult to let go when I am hurt. I try and apologise as and when I can - but yes holding onto a grudge seems easier than letting go. I wonder why we feel better in holding onto something so negative rather than moving on and letting go? It's the ego, Shalini - it will always come back to our attachment to our status and sense of self in the individual way. When someone has truly hurt us it requires maturity to be able to convey that to them and to forgive, even if there is not apology. good idea to combine the two. to me forgiving is a lot easier than forgetting. and sometimes it takes me a while to forgive, it is not easy.. but holding a grudge and not forgiving, holding hate for a hurt, is like taking poison and waiting for the other person to die. Forgiving can be the hardest thing in the world when the hurt has never gone away. I can forgive most things... but not the taking of a life. I definitely agree with the fact that you can forgive but you don't have to forget. I think forgiveness frees you, but if you remember the lesson then you are less likely to end up repeating the pain a second time.